The Florida Building Code (FBC) is updated every three years and may be amended annually to incorporate interpretations and clarifications. The Florida Building Code is based on national model building codes and national consensus standards which are amended where necessary for Florida’s specific needs. The code incorporates all building construction-related regulations for public and private buildings in the State of Florida other than those specifically exempted by Section 553.73, Florida Statutes. It has been harmonized with the Florida Fire Prevention Code, which is developed and maintained by the Department of Financial Services, Office of the State Fire Marshal, to establish unified and consistent standards. On March 15, 2012 the new FBC went into effect and the NFRC was a part of the update. This is particularly important on replacement / retrofit jobs. According to the FBC, all non impact windows need to meet a .65 or less U-Factor and a .30 or less SHGC. Impact windows need to meet a .75 or less U-Factor and a .30 or less SHGC. 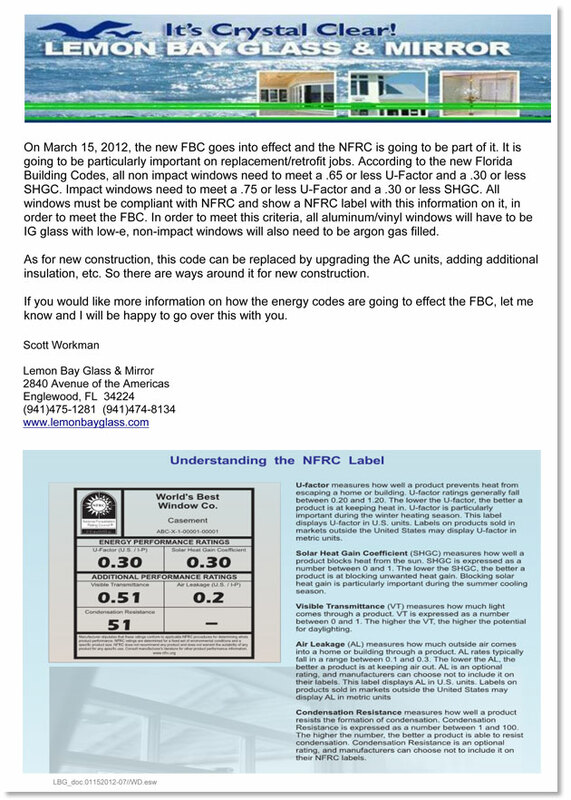 All windows must be compliant with NFRC and show a NFRC label with this information on it, in order to meet the FBC. In order to meet this criteria, all aluminum / vinyl windows will have to be IG glass with low-e, non-impact windows will also need to be argon gas filled.